When it comes to thrifting trips, I don’t really need much of an excuse to hit the road. 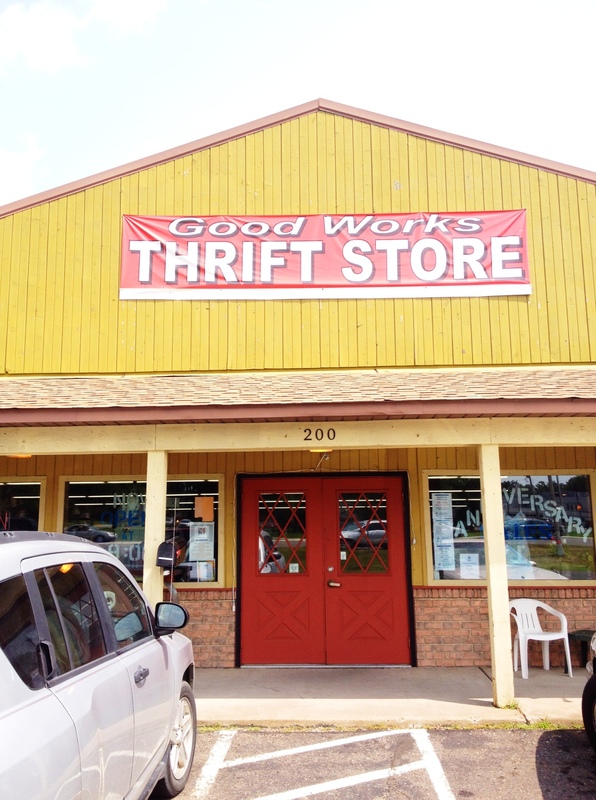 So this past summer, when I got an email from Michelle, inviting me to check out the new Good Works Thrift Store up in Mora, I didn’t hesitate. Enlisting the company of my dear friend Meggie, who was at the time waist-deep in a whirlwind of wedding planning, we hit the road one sunny Friday afternoon, Mora-bound. 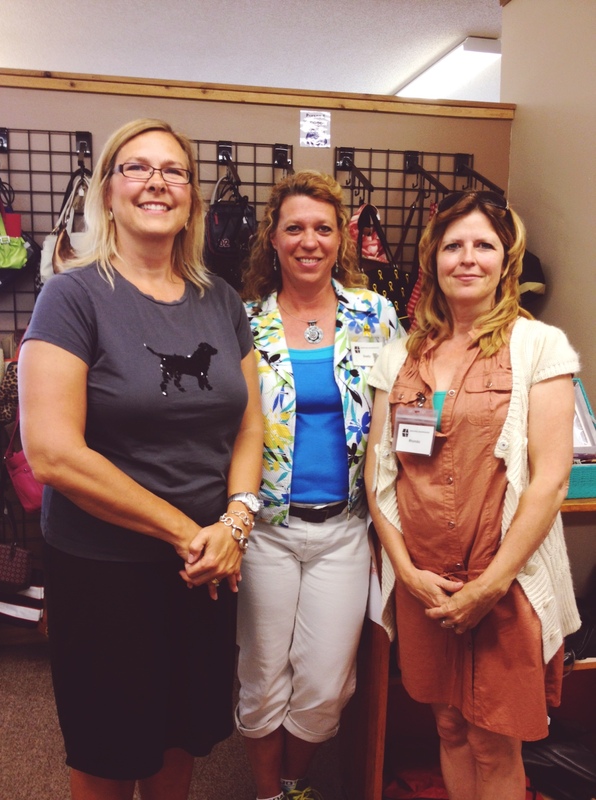 Greeting us at the store was a trio of lovely, passionate and proud employees, including Rhonda, the store’s manager (right) and, of course, Michelle, director of sales and marketing (left). I was immediately struck by the quality of the merchandise; this is NOT one of those junky thrift stores you can find up in the country. Good Works store is large and in charge, naturally lit with big windows up front. I was really impressed by the assortment of home goods, glassware, craft supplies, lamps, side tables and books. Meggie, hunting for the cake carriers, jam jars, vases, plates and Pyrex that would bedeck her wedding tables, had TONS of luck, loading up an entire cart. Prices were fair overall, and the curation of items was totally sensible, with books organized by genre and finer dishes stages on tables to give a sense of how they’d look at home. Based on the overall sense of organization, it’s clear that a lot of hard work, thought and elbow grease went into getting this store up and running. (Stay tuned for a full store review on Good Works in coming months!) Thanks for inviting me up, Michelle! 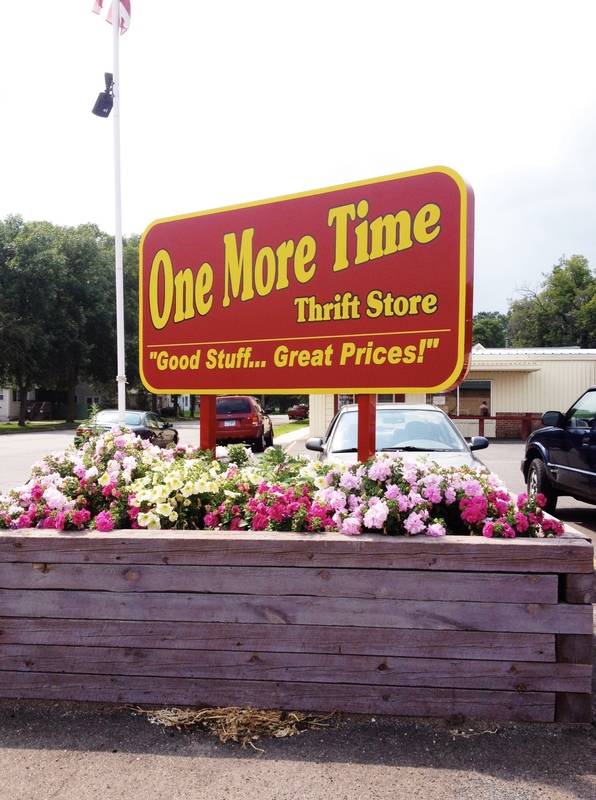 Upon Michelle’s recommendation, we headed towards Mora’s “downtown,” to hit One More Time Thrift Store, a charitable thrift run by 7-County Senior Federation, which lies about two minutes away from Good Works. While smaller in square-footage than Good Works, One More Time’s bargain-basement prices make it well worth a stop. 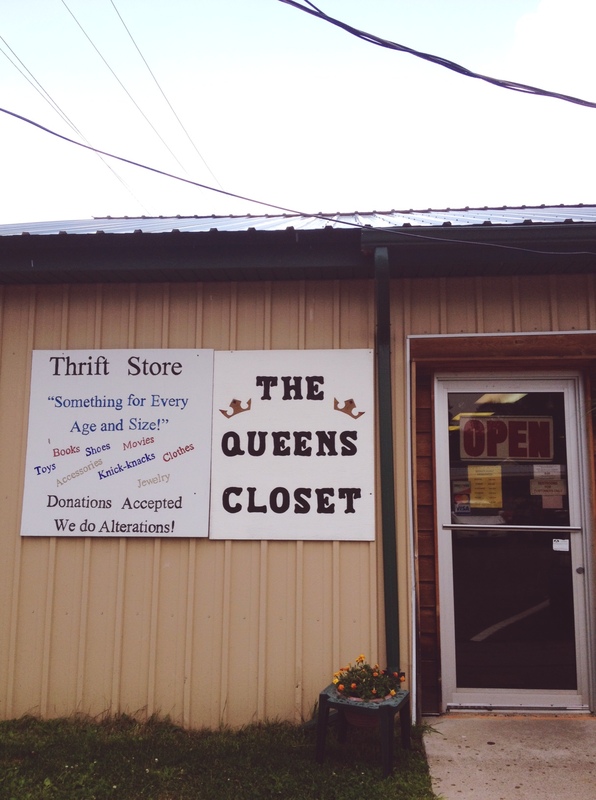 Third time’s a charm did not turn out to be the case for our third thrift-store destination—The Queen’s Closet, located directly across the parking lot from One More Time. Set in a kind of squat building, both Meggie and I were underwhelmed by the random, sparse, disorganized assortment of merchandise in this two-room store. 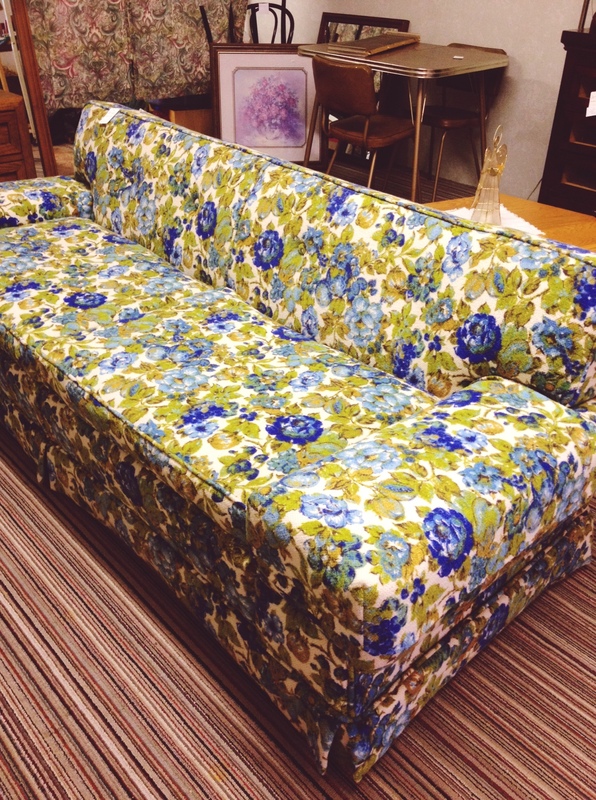 This couch was really cute though! 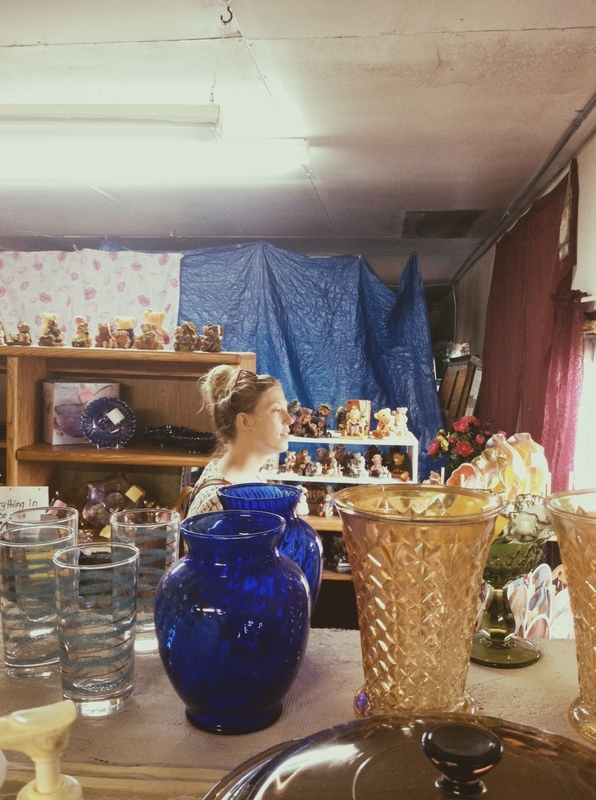 Our last shopping stop on the way out of town was the Brunswick Flea Market, a sprawling year-round barn-market that boasts a lot of vendors, a huge assortment of merchandise and pretty high prices. 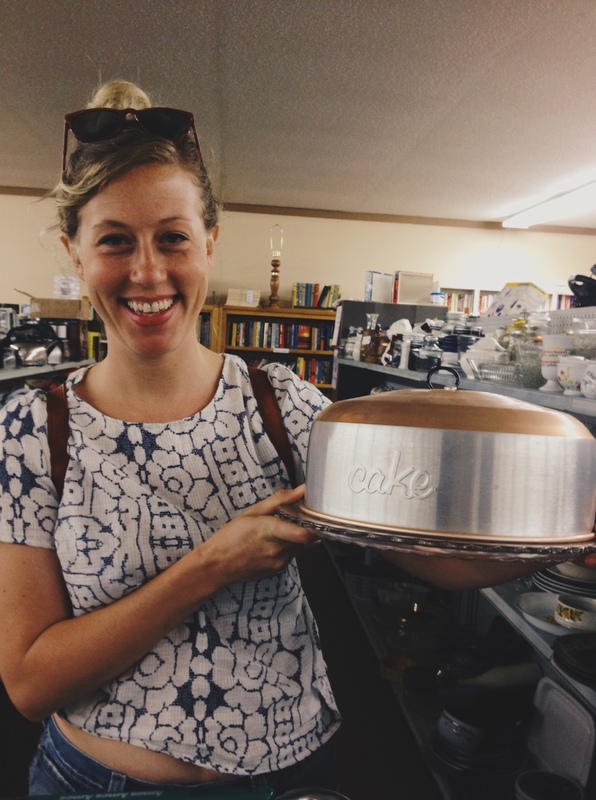 To get the deals, you’ll need to dig (Meggie scored an amazing ’70s cake carrier for $2! ), so definitely don’t stop in unless you have some time to browse. And be sure to bring cash, as they don’t accept cards! All this shopping had left us feeling famished, so we wound up pit-stopping at the Brass Rail in Grandy, right on Highway 65. A small-town bar turned chicken joint, it took all of one bite of their broasted chicken for us to understand why it’s what they’re known for! 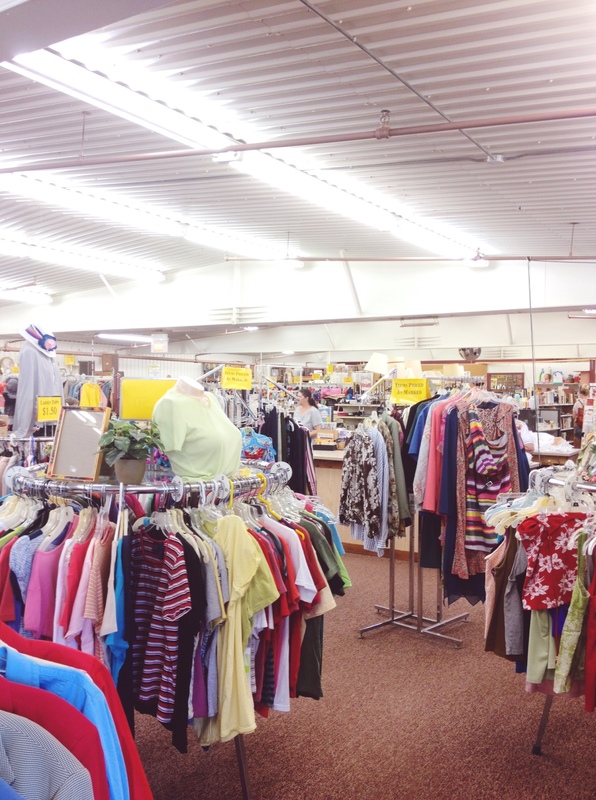 If you’d like to pay a visit to Mora’s thrift-store scene, here’s a handy map to help guide you on your way! If you head up there, I’d love to hear what you thought and better yet, what you found! (Speaking of finds, I’ll be back tomorrow, sharing a few things I took home from our trip to Mora!) And be sure to check out my guide to thrifting along 35-W, in case you’d like to make a big loop, or my guide to thrifting in Cambridge, which is also on the way to/from Mora! 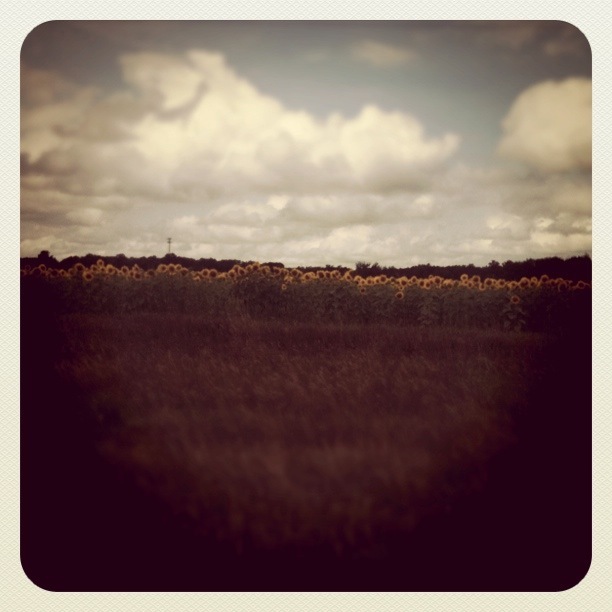 Sixty-five miles northwest of Minneapolis is a little place called St. Cloud, aka my boyfriend’s hometown. Sweetheart that he is, every time we visit his family there, he builds in time to accommodate me and my tiny thrifting addiction. (Thanks, honey!) Overall, I’ve found the prices to be comparable to Twin Cities shops, but the selection is much less picked over. 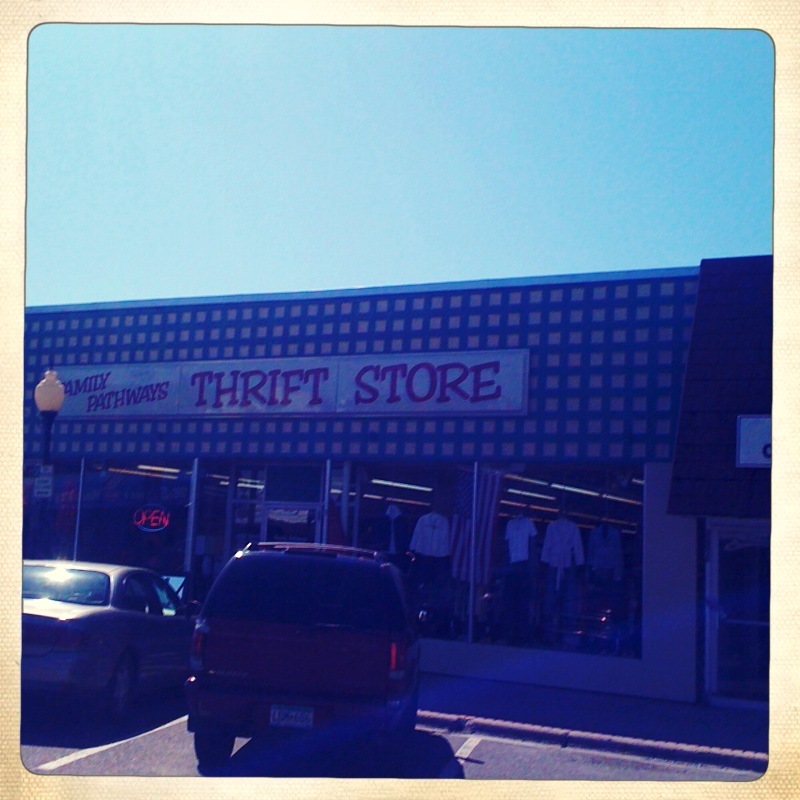 In other words, there’s great thrifting just an hour or so up Highway 94! To make your thrift-trip to the Granite City a breeze, I put together a map featuring my favorite spots—updated to include new stores and expanded locations. They’re spread out loosely along Division Street, so please do click “View Larger Map” to see all of the stores. And if you click on the pinpoints, you’ll find details like hours, websites, phone numbers and more. If shopping leaves you famished, stop at Bravo Burrito or Val’s Rapid Serv, two of my favorite spots for cheap and delicious eats. I promise you won’t be disappointed by either. Today was confusing. It started with an emotional airport goodbye. Followed by a trip to Menards for bathroom lighting that ended with me buying two door mats with daisies on them and a three-pound bag of Red Vines. And then, when I took my lunch break, on this first day of MAY, flakes of SNOW pelted me IN THE FACE. But I’m not letting it get to me. Because May in Minnesota = the start of rummage-sale season, aka my favorite time of the year (second only to Christmas, of course). Topping my list of May sales to hit is the 100-Mile Garage Sale, a three-day bargain-hunting extravaganza that stretches all the way from Winona to Red Wing. Thousands of individuals, businesses and even entire TOWNS clear out their basements, garages and attics to participate in this event. Not sure where to start? Just head down to beautiful bluff country and look for the flags, balloons and signs along Highway 61 on the Minnesota side (35 on the Wisconsin side) and get to spending. Here’s a map to make it easy—click on any of the markers to see more info (hours, addresses, featured goodies, etc.) on specific sales. You can also search the listings here, in case you’re on the hunt for something(s) in particular. Helpful, huh? I can’t wait to check it out! Are there any big rummage sales you’re looking forward to this spring? Big or small, I’d love to know which ones are on your must-hit list! 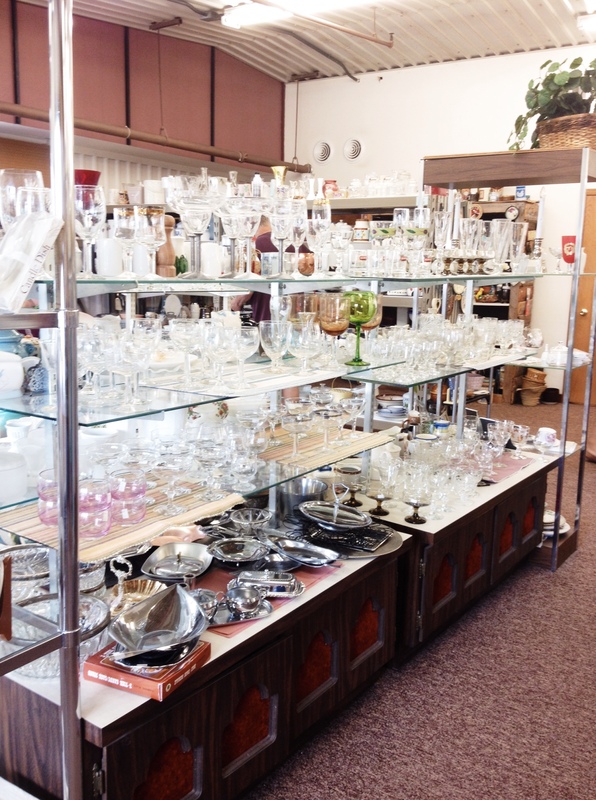 I thought I’d start the week off by sharing a little about one of my favorite weekend thrifting destinations: the wonderful town of Elk River. 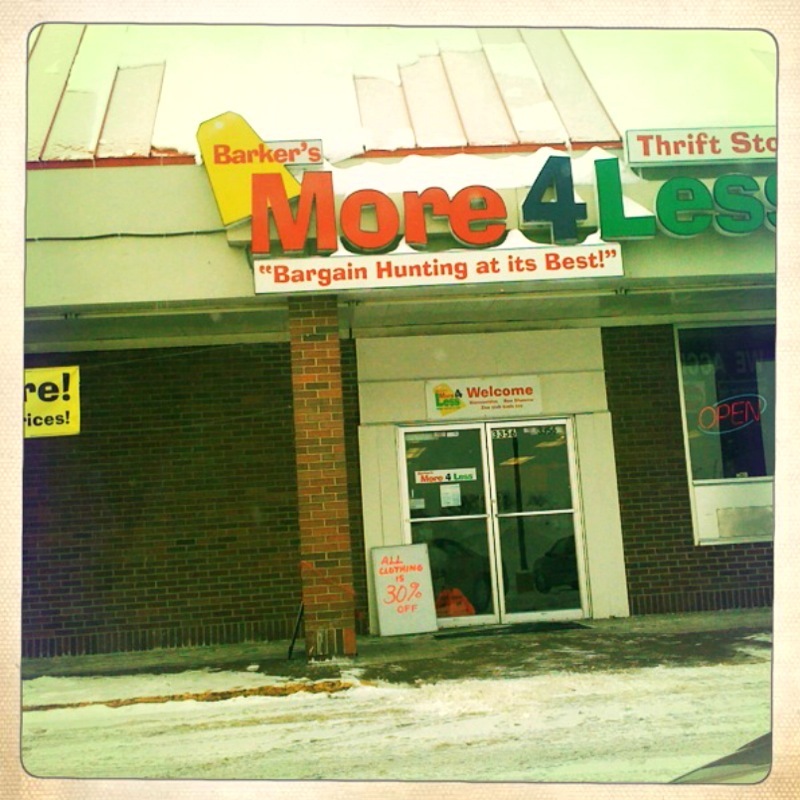 Just 40 or so odd minutes outside of the Twin Cities, Elk River’s proximity makes it accessible enough to hit in an afternoon, and once you get there, you’ll find a bunch of thrifts clustered all together. Which to me, makes the drive totally worthwhile. 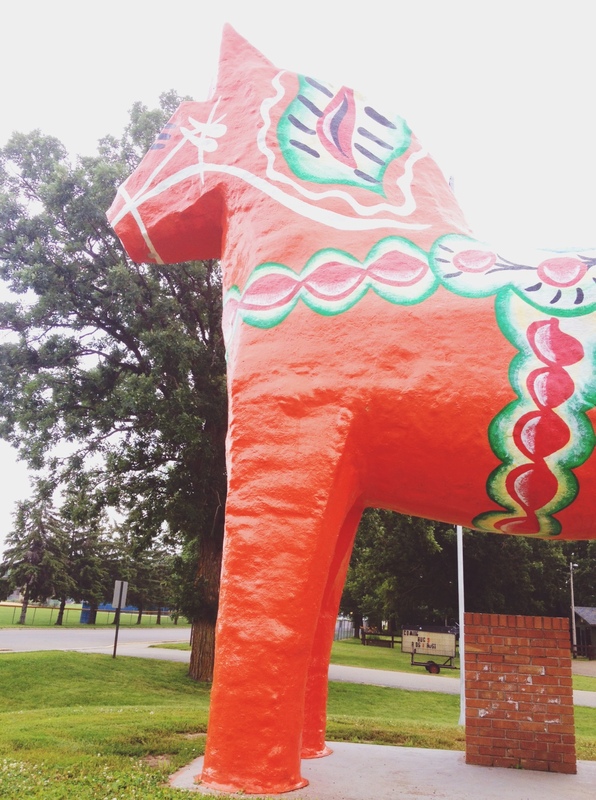 On 169, you’ll find a big ole’ Sal Val that’s in an old grocery store, a Goodwill and a decent-sized charity thrift called Samaritan’s Way. If you head into town, you’ll find Antiques Downtown, a two-story antique mall that’s packed with cool stuff. My favorite dealer there, hands down, is on the second floor, right at the top of the stairs. You’ll know it when you see it because it’s all vintage jewelry. It’s pretty cheap too! Anyhow, I could go on and on about the many trips I’ve taken there through the years, but I’ll leave it up to you to discover for yourself. 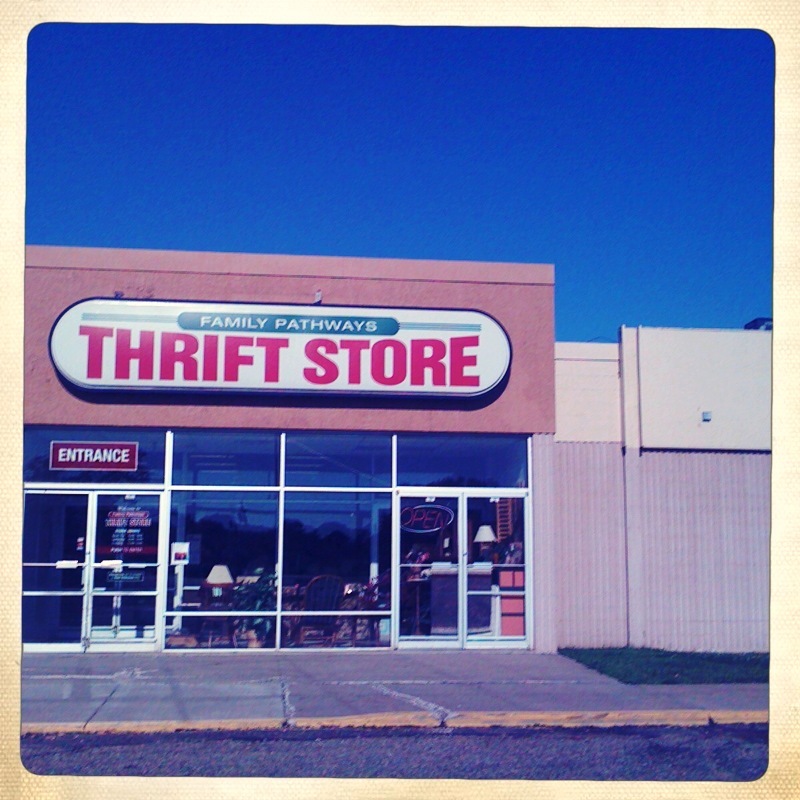 To make your thrifting journey easy as pie, below you’ll find a map to all my favorite spots. Tip: Click “View Larger Map” to see them all! And click the pinpoints to see pics and details like hours, phone numbers, etc. If shopping leaves you famished, stop at Minne’s Diner in Rogers for some good eats. And then go to the Goodwill across 94! There’s also a Sonic and a Culver’s off 169 in Elk River, if fast food floats your boat. 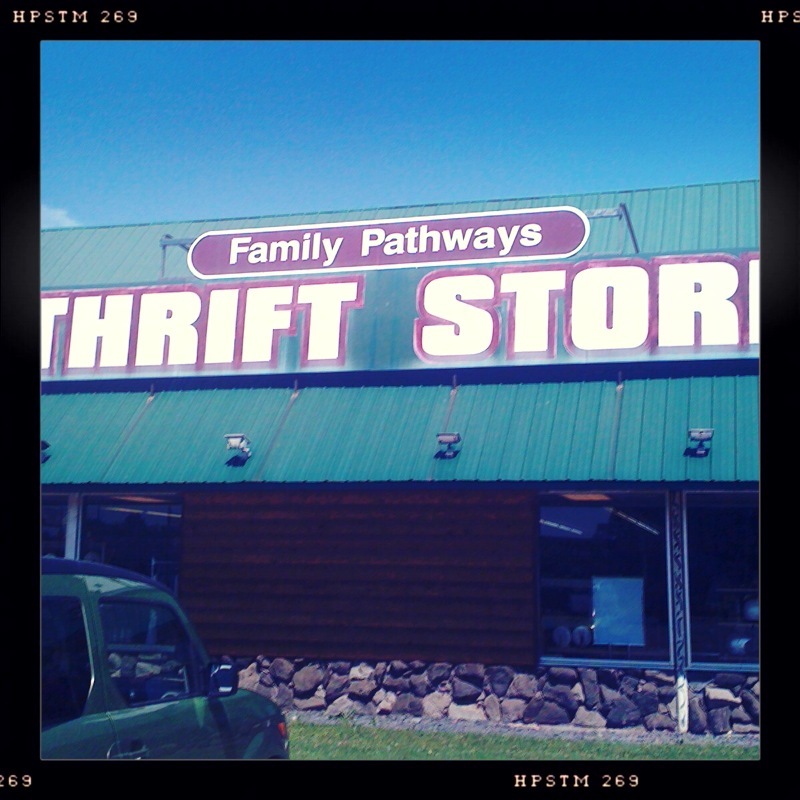 P. S. Check out some other thrifting maps I made of Family Pathways stores up Highways 35, thrifts in St. Cloud and stores on the way from Minneapolis to Cambridge. Today I’m sharing one of my favorite Saturday morning thrifting trips, from Minneapolis to Cambridge. This route rocks because it’s peppered with thrifts you can visit on the way, and once you’re to Cambridge, there are three stores within a couple of blocks. The drive’s do-it-in-your-sleep easy–just cruise up Central Avenue (also known as county road 65) and you’re there! I recommend going on Saturday mornings before traffic builds up (there are a ton of lights on 65). And, some of the thrifts in Cambridge close up shop in the mid-afternoon on the weekends. New to this map, I included a few of my favorite spots to stop for snacks, ranging from the co-op in Cambridge (if I’m hankering for kombucha) to the Main Street bar/grill that makes delicious Bloody Marys and super cheap burgers. If you like this post, might you find my thrifting maps for St. Cloud, Burnsville and up 35W useful too? When I leave work feeling like a crabbed-out stress case, there’s one thing that can always make me feel better: Shopping. Thrift-store shopping, to be exact. I wait until traffic dies down, and then grab my iPod, some water and hit the road. While most of my favorite thrift trips are all-afternoon adventures, I’ve got a few routes down that can easily be done after work (even if you’re a 10-6-er like me). This one, back and forth to Burnsville, is one of my ole stand-bys for those nights when retail therapy is most definitely required. I like to head south on 77 (Cedar Avenue) so I can hit the Savers that’s barely in Apple Valley. Then I cut across to Burnsville on Cty. Rd. 42 which leads you directly to the Unique and Salvation Army stores. (Pro tip: If you’re stretched for time, just hit the Unique and Salvation Army in Burnsville—they’re literally across the street!) From there, you can head back to Minneapolis on Hwy 35W, or cut back to 77 on Highway 13 hitting Antiques Minnesota and the Chap Thrift shop in Burnsville along the way. 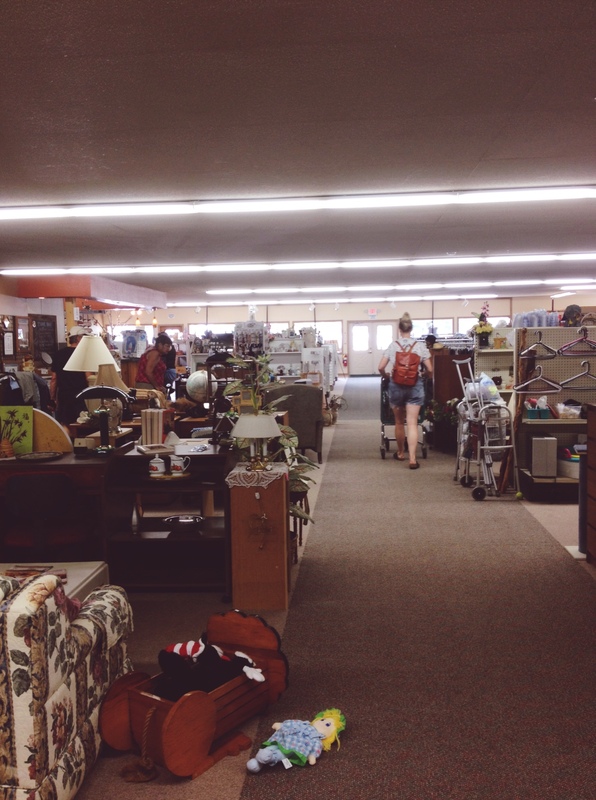 If you liked this post, check out my other thrifting treasure maps…one for St. Cloud and another featuring Family Pathways Thrift Stores up Highway 35. ♥ Every Family Pathways I’ve visited has been clean and staffed with very friendly folks. Every shop has fitting rooms and all of them accept credit cards. ♥ Some (Rush City, Wyoming and Pine City) are open on Sundays. This is a definite plus for someone who can’t get out of town to thrift Monday through Friday. ♥ The chain offers a Frequent Buyer Bucks punch card. Once your card is full (or, after you’ve spent $120), you get $10 off your next purchase. You can rack up punches at all the shops, so if you’re a regular thrifter, it’s smart to get a punch card going. ♥ Unlike many thrift stores, at most Family Pathways, the staff separates the vintage and “retro” items from the regular merchandise. Keep you eyes open for a stand-alone rack (sometimes labeled “Retro Rack” or “Vintage”) or display, usually found towards the front of the store. Usually they lump older clothes, housewares and gadgets all together. ♥ One of my big pet peeves with some thrifts, like Unique, is inconsistent pricing. At Family Pathways, everything’s pretty standard. All vintage dresses, for example, are going to be around $4. This, I like. This is one of the biggest Family Pathways, and also one of the most far-flung off the highway (about five minutes). I was impressed with the furniture selection and the huge amount of housewares. The clothes were kind of meh and I didn’t spot a vintage section. I also felt the pricing was a bit higher here than the other stores. Perhaps because it’s the closest to the Cities? No photo of this one, sorry folks! This is an average-size store, with so-so merchandise. 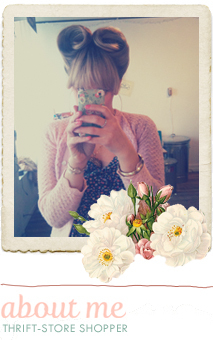 I’ve found some nice ’70s and ’80s dresses here along with my favorite “I ♥ Dancing” key chain. It’s also one of the easiest stores to get to—you can see the shop from the highway. 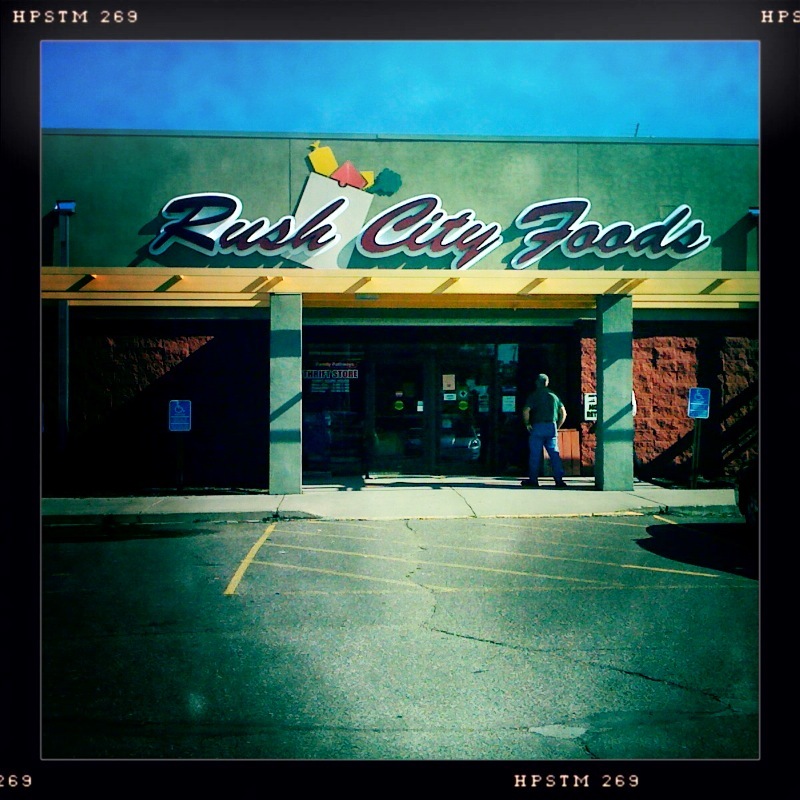 The Rush City store is tucked into the same building as a grocery (Rush City Foods), liquor store and bakery. It’s pretty small, but they have a healthy selection of vintage stuff. Last weekend, I found some really precious 1950s duds for a baby boy, an incredibly cute red and white polka-dotted country square-dancing dress and a handful of other nice dresses. The Pine City shop is also just a hop-skip-and-a-jump off the highway. This store went through a thorough remodel this year leaving it very clean and spacious. I bought a collection of vintage pop bottles there for 25-50 cents each, and have also found some pretty retro dresses, including a sleek silk cocktail dress from the 1960s. The furniture selection is pretty slim. At the risk of feeling like I’m picking my favorite kid here, I have to say that this is my top pick of all the Family Pathways. First of all, I’m a sucker for tiny, old downtowns, and this shop is right on Main Street in Hinckley. It’s a good size, and right up front, there’s a huge display of all kinds of antique-y, vintage-y goodness. I filled up a basket this weekend with tons of pretty things, including a sweet silk Diane von Furstenberg blouse, a Grand Old Opry souvenir and some new (old) thigh-high stockings. I also found some sweet postcards from the 1970s. Expect to see a more detailed store review of this shop coming up in the next couple weeks. Family Pathways also has shops in Cambridge, Isanti, Princeton and North Branch, but since they’re not on 35, I left them out of this little round-up. (You can find info about all the stores here.) The money spent at these shops goes to supporting senior services, food pantries and youth services programs. The nonprofit has been serving Isanti, Chisago, Pine, Kannabec and Mille Lacs counties for nearly 33 years and meets the Charities Review Council Smart Givers standards. I hope that this post and the map is helpful. I’m thinking of making more maps of some my favorite thrifting routes. Is that something y’all would be into? Let me know! P.S. Many thanks to my sweetheart, who told me about Family Pathways back when we first started dating, long before this blog was born. You’re the best, honey!